The enhanced probability of catastrophic wildfires has increased our need to understand the risk of floods, erosion, and debris and contaminant transport in burned watersheds. This project investigates the relation between rainfall intensity and peak discharge; erosion and deposition processes; and water-quality impacts to minimize the loss of life and property resulting from post-wildfire floods. The enhanced probability of catastrophic wildfires in the western United States and elsewhere in the world has increased the need to understand the flooding risk and the erosion and depositional responses of burned watersheds. In addition, surface water flowing from burned areas may carry increased levels of sediment, organic debris, and chemicals that may contribute to significant degradation of municipal water supplies and aquatic habitats. Our project has three main thrusts: (1) we are investigating the relation between rainfall intensity and peak water discharge from burned watersheds, a relation that depends on the size of the rainstorm, the size of the burned area and burn severity, and the changes in infiltration capacity of the soil; (2) we are investigating the hillslope and channel erosion and deposition processes after wildfire with a focus on predicting these processes on a watershed or landscape scale rather than on a single hillslope plot or channel cross-section scale; and (3) we are examining the water quality impacts of wildfire and are synthesizing post-fire water-quality sampling protocols. An extensive body of literature exists on the effects of wildfire on watersheds. Wildfires have burned across the landscape of the western United States for centuries, but the magnitude of the geomorphic effect on the landscape is unknown. By understanding the magnitude of the runoff response and the erosion and deposition responses of recent wildfires, we can provide data for landscape evolution models in areas prone to wildfire. In addition, an understanding of the runoff response will contribute to better methods of predicting post-fire flooding to minimize the loss of life and property. Watershed-scale predictions of erosion and deposition from these natural disasters can be used by land managers to prioritize forest treatments based on erosion potential before and after wildfires. Moreover, we hope to contribute to an understanding of wildfire as an element of an ecosystem’s disturbance regime. Water being released from Strontia Springs Dam after wildfire-related flooding. Moody, John A.; Ebel, Brian A.
Moody, John A.; Shakesby, Richard A.; Robichaud, Peter R.; Cannon, Susan H.; Martin, Deborah A. Current research issues related to post-wildfire runoff and erosion processes; 2013; Article; Journal; Earth-Science Reviews; Moody, John A.; Shakesby, Richard A.; Robichaud, Peter R.; Cannon, Susan H.; Martin, Deborah A.
Ebel, Brian A.; Moody, John A.
Ebel, Brian A.; Hinckley, E.S. ; Martin, Deborah A.
Hyper-dry conditions provide new insights into the cause of extreme floods after wildfire; 2012; Article; Journal; Catena; Moody, John A.; Ebel, Brian A.
Ebel, Brian A.; Moody, John A.; Martin, Deborah A.
Hydrologic conditions controlling runoff generation immediately after wildfire; 2012; Article; Journal; Water Resources Research; Ebel, Brian A.; Moody, John A.; Martin, Deborah A. 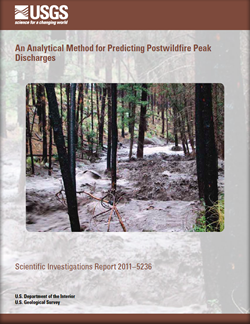 An analytical method for predicting postwildfire peak discharges; 2012; SIR; 2011-5236; Moody, John A.
Spatial variability of steady-state infiltration into a two-layer soil system on burned hillslopes; 2010; Article; Journal; Journal of Hydrology; Kinner, D. A.; Moody, J. A.